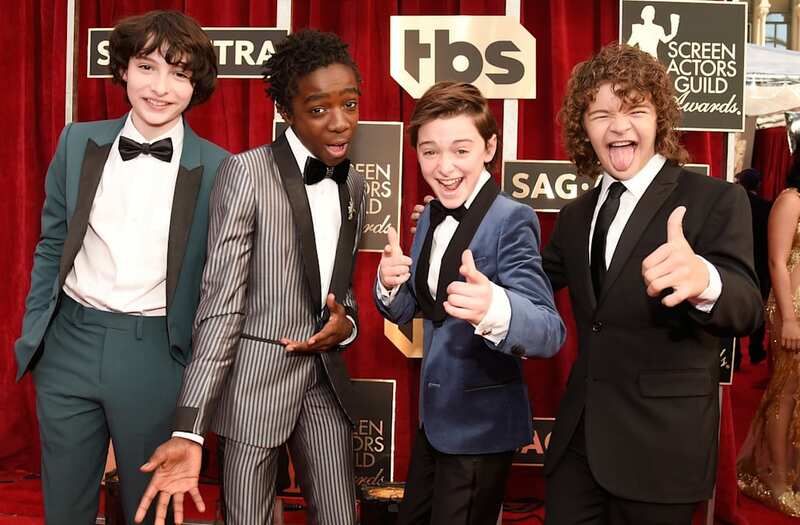 The kids from Netflix's hit show, "Stranger Things," hit the 2017 Screen Actors Guild Awards red carpet together on Sunday night, and they brought the glam -- and the fun! Millie Bobby Brown, Caleb McLaughlin, Noah Schnapp, Finn Wolfhard and Gaten Matarazzo rocked the red carpet in a variety of ensembles that showed that they're already embracing their roles as the most popular tweens in the game. Brown looked gorgeous in a red gown with tulle sleeves and finished off the look with a simple headband. The boys all opted for different places on a tux, with Schnapp really going for it in a blue velvet jacket with matching shoes. We particularly loved McLaughlin's smooth ensemble, which was brought to whole other level by his decision to go sock-less in his Gucci loafers. The kids shot to fame last summer when their show received rave reviews and became the binge-watch show of choice of the season. They star in the '80s sci-fi series alongside Winona Ryder.